On Sept. 20th 2007, I had a bicycle accident while riding in San Dimas, CA leaving me with a spinal cord injury at the C8 level. 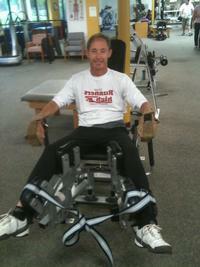 A quadriplegic, paralyzed from the chest down and losing most of the use of my hands has given me a new challenge. After the initial shock of realizing that my life as I knew it was gone, and after much soul searching I decided that I would fight to recover as much as I can so that I can enjoy a full life again, to walk, run, hike, play my guitar, garden, etc. I was convinced that I would walk out of the hospital, but came to the realization that my struggle will be longer and harder than I initially thought. One of my many aspirations is to be able to walk my daughters down the aisle when they decide to get married. After a lot of research, there seems to be only one viable approach today that will provide the biggest dividends, Activity/Exercise based therapy. Hopefully in the future, Stem cell therapy will play a big part in recovery. However, neither are covered by my HMO Kaiser. I have begun Activity/Exercise based therapy at Project Walk, a therapy center specializing in spinal cord injuries. Many clients have experienced significant improvements in mobility and some have even “walked away.” I am convinced that I will benefit as well and have already seen improvements. There are several people I have met there who were at my capability level or worse when they started, and I see them walk around the center. A few “graduates” have walked in to visit, so I know that it works! The greatest challenge is the high cost for the excellent program. The required funding for Project Walk is between $20K to $50K per year. If you would like to obtain more information about Project Walk, visit their website at www.projectwalk.org. In order to help finance the cost of treatment at Project Walk, a fundraising campaign has been established in my honor with the Catastrophic Injury Program of HelpHOPELive. HelpHOPELive is a non-profit organization that has been assisting the transplant community for nearly 30 years and catastrophic injury patients since 2000. Please make a tax deductible donation to my cause and help me realize my dream of walking and enjoying life once again. Contributions to Van’s fundraising campaign can be made via check or credit card. Please call 800-642-8399 or click the “DONATE NOW” link at the top of the page.